I have a time compressed, mix bag update today. Gabriel and Damian, thanks for taking the time to leave a comment - yes, scratch building....for me, a certain willingness to proceed, even without absolutely clear direction is required, and you just have to live with what you make - and, as it's a hobby, if things don'tr go as well as hoped, well, there you go! I'll cook up a design concept and establish an approach, but as I'm not working to drawings (though I do look at lots of reference images), or have machining tools beyond a knife, file and hand drill...well, I wouldn't get anything done if I tried t make things perfect...And unlike both of you, my painting skills - well, let's say I have room to improve! I only use acrylics - which on one hand are easy to use and clean up (and, indoor OK, no smell etc - which is relevant to where I live), go on smoothly, and so on but - they are not as ideal for achieving a mirror, auto quality finish! So, for today - some progress on the red bull Ford, a surprise new Chevy + engine, and...an idea for another, but altogether different Chevy! Wheels! my own blend of Vallejo model air Ferrari red and Signal orange, plus, a gloss clear coat and light polishing - looking good! As for the body....all sorts of paints, overlaid, mixed, ghost tinted, kitbashed decals, layers of gloss coat - and...it's getting there - If you look at the prototype, it has a multilayered geometric pattern - so, I tried to match it. Great update Nick, I really enjoy checking out your scratchbuilding and detailing work. It's something I haven't done a lot of but I have grand plans for several builds in the near future. Keep up the awesome work and keep the updates coming. Hi Damian, thanks for taking the time to leave a comment - appreciate it! You might like doing scratch building - you already take on some pretty complicated modifications and repairs. It’s funny, every now and then I read people suggesting a good “first project”, which is to build a “simple” 1” cube from styrene - ha - 8 corners of misery! Oddly less easy than it sounds, and from my experience, not a great way to start - even a bit discouraging - lol....maybe easier to just start a modest project and keep going. There are some great builds over on the current Armorama scratch builders campaign - Angel’s work is something else! As for my progress - I’ll paint the rolling chassis for the Red Bull, and will keep going on the super Chevy - cab’s about halfway done. The basic tub is done, engine installed, and early steps on the rollcage are underway. For the body, I’m at a standstill - I have a photo etch grill for a 1970 Chevelle - which I think will fit and look perfect - uhh, except, I can’t find it!!! I could, and may eventually just make it from styrene - but I have an image that the lost part would be perfect! That said, my track record for visualization versus reality is sometimes spot on, and other times, altogether wrong! Lol I guess we’ll eventually find out. As above, you can see, a lot of modifications happened to the bed area - to my happy surprise, you can't see that the flat surface on top of the fenders is actually many pieces of styrene, including the model kit bed, and extra material extending inward and outward, and that the back is reworked (I cut off all of the kit's rear parts) - and there just aren't too many areas where you can see a gap or transition. Nick, I've not posted anything in awhile mainly because I am usually speechless looking at you builds WOW! It is not a Chevy but I can say I saw this Taco and totally thought of you. 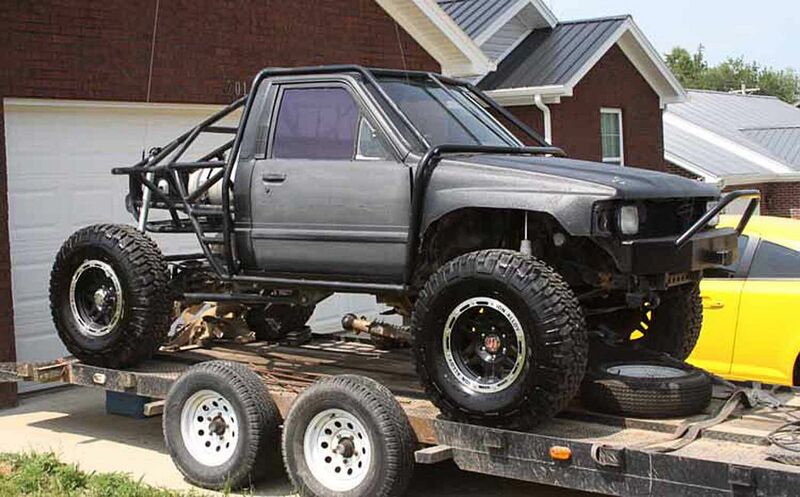 Probably made for rock crawling rather than desert racing but hey this IS Kentucky! Again I love your work and I love going under the skin to inspect all the very accurate mechanisms you produce - SUPER! While not much in the paint department I think the guy has done an outstanding job on that exoskeleton roll cage and how tightly it conforms to the body! Thanks for taking a minute to drop by, and for the words! Funny enough, I think looking at one of your projects made me think about adding a representation of fuel injection racks on this build - On your post, you pointed out that while hard to see, you know it's there - and having seen enough of your work, I know you're both good at doing that sort of thing and usually pretty accurate with what you build! So, a tip of the Xacto to you for the motivation to add those bits to my Chevy! Speaking of other stories....as I proudly began fine sanding on my "fantastic" Chevy body....I kept thinking that I saw a seam along the roof..and then not...Hmm?? what's that all about..?? ahh - as you might recall, I cut the cab into several sections before gluing it all back together. I also built my driver's cabin to match the contour of the truck's body...Beauty once together - but, to mate the cab/chassis to the body, I needed to flex/stretch the body to fit it together. This is common enough - but, I really needed to stretch the body to get that cabin to fit...hmmm?? stretching a body shell that has had lots of modifications, and doing the stretch/test fit over and over again, what could possibly go wrong...? Well a seam can open up and then close again depending on whether you're stretching the body or not. And no, just because you cant's always see it doesn't mean it goes away...you just can't see it - but, it's still there...darn. I really like the "tip of the Xacto" expression! As far as the "Ghost Seams" go Matter says reenforce the underside if possible, then re-do the putty and sand again. Try not to bare down too much while sanding as this can open up an all new ghost! Go ride a Cable Car for me. (Don't call em trolleys) Gosh I miss your city! and the new chevy and red bull side by side - what you cant really tell in this pic is how much wider and taller the chevy is - the ford was a built promo model likey 1/27 or so scale - the chevy, actually 1/24 or 1/25 so it's a bit bigger. Ok - need to catch a bus - model on! Nick, my friend, I think you have created a category of your own . I'm hardly understanding what is under those hoods of yours, but they look darn good. And the amount of detail you manage to squeeze between the "stickframes" is unbelievable. Definitely I need to follow your builds more consistently, because there is a lot to learn from here. As to the nature of building these trucks - they are officially defined by SCORE Intl as “Trophy Trucks”, for use in off road races, like the Baja 1000. They are an unlimited class - leaving racers (and me!) with latitude. As I’m feeling more confident about what I think I can build, and thanks to google, I’ve been trying to gradually get closer to the real thing. Several key problems emerge: the engines, well they are generally between 750 and 900 HP V8s, but, they run carbs, fuel injection, even throttle bodies...and can be big or small blocks, or something else - so what should I actually build? ; next, the bodies are only shells that loosely represent what’s sold under the official emblem - as I’ve demonstrated I don’t have the skills to hit the exact look. So, I try instead to demonstrate “convincing realism” - heck, I know I’m not hitting each detail 100%, but this is a fun challenge. As it’s not work (where detail and quality really counts!!) it’s a hobby, so I can comfortably live with some leaps of faith - If I see something cool or interesting, I’ll give it a go. Recurrent problems I run up against are: first, maybe not knowing exactly how a part works, it’s precise size, and what it looks like on all sides; and, the scratch builders’ enemy: asymmetry (unintentional) - try as I might to avoid it, this just happens (think, no plans or dimensions, scratch and kitbashing) which can equal not always parallel, perpendicular, evenly spaced etc - but, I’ve got to keep moving - so adapt along the way. I can live with all of this to a point - if it flatly looks wrong or wonky, it’s not that hard to tear it out and try again - yes, speaking from seeing it, not liking it, redoing it! Ok - happy model building gents! Hello model builders - I'm calling the red bull Ford, done! I mentioned my attempt at the multi layered paint scheme in other posts, but here you can actually see it, and the good and less good attributes of the finish and the ghost tint over it - the good, it's a bright, candy finish - the less good, it's not a perfectly smooth surface (the ghost tint doesn't, I've learned, dry completely smooth), and, it's not sandable. As a whole though, I like the way it turned out. And that's it - the bright sunny day certainly helps with a crisp, clean look - it also makes the various flaws jump right out - lol - back to the good, I'm pleased with the overall look and stance of this truck. And, I haven't forgotten about the other big Chevy - it's about ready for paint - I'll post some progress pics of it in the next few days. Hi Nick. That is one tough looking rig mate, great job! Like Gabriel said earlier, these builds are in a category of their own, I'm having trouble getting my head around the planning and measuring and trial and error that goes into this type of build. Looking forward to progress on the big Chevy. Hey Damian - thanks, yeah this is a strange subject and approach to model building - fun tho! Yes, I plan to get the big Chevy wrapped up soon - so far so good. I’ve got a few kits lined up - but, not for the next build. My hint about what’s next: it doesn’t qualify for the Blue Oval campaign...per your criteria - and I’m looking forward to it. And, no, it doesn’t throw dirt and if all goes according to plan, will be complicated. Sadly, this marks the end of this series of off road race vehicles. Sort of a self imposed, one participant campaign I suppose. The last truck finished is a redo (to be clear, altogether new build) of the first truck shown on this thread. So, for now, a newer, almost Chevy body - it's a Cadillac Escalade from the early 2000's - which while still wrong, is fully at least a decade newer than any choice I could find for an actual Chevy or GMC - so, I'll live with it! Next, I took a significantly more dramatic approach to the body modifications - specifically raising the height of the top of the front wheel opening and reworking most of the bed altogether. This is relevant on the real truck because it allows for a lower center of gravity (chassis ride height) while still allowing a full travel suspension, front and rear. You might recall from earlier in this thread I included a sequence of photos showing rear suspension travel from a dead stop on to a jump. These trucks have a lot of vertical wheel travel. Finally, the paint- it's still wrong - it should have been more of a turquoise. I couldn't find a Vallejo match, so I settled on a light blue - similar tone, wrong shade. So - As a whole - I like this build quite a bit - that said, I would really rather it be based on a newer Chevy body! this is close enough, and was certainly a challenge to build. Not a bad stable of horsepower - lol. Happy trails.